While much has been said about sponsorship of in-school assets like stadiums and curriculum, the most obvious of revenue generating assets has until now been overlooked, websites. School administrators are neither sponsorship salesmen or web specialists, and Sponsor-ed believes that creates an opportunity. 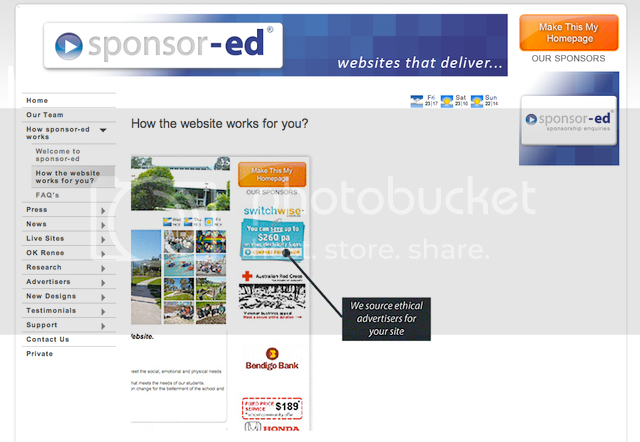 Currently only available in Australia, Sponsor-ed is setting out to help provide schools with websites that actually generate some income from sponsorship. Today many schools create their own custom websites as a cost-center, but when it comes to monetizing these sites they're stuck with generic ad networks like google, which could potentially serve up all kinds of ads outside the control of school administrators. Sponsor-ed hopes to mitigate this by managing what types of local and national advertising visitors see, thus far ruling out fast food, alcohol and tobacco. Sponsor-ed also plans to take away the hassle and cost of creating the website, as they give it away for free. "A website that will save schools time and money along with the added bonus of contributing to the fundraising effort. This concept has enormous potential," one principal who tried the platform said. Director Denis Masseni told The Daily Telegraph that schools have the potential to earn between $10,000 and $30,000 a year. An interesting concept to keep an eye on.